Apple iPod Engineering Manager Allen "Skip" Haughay has been tragically killed while riding his beloved horse, Regal Bull, reports Mercury News. Haughay, 48, was riding his horse to a party in Morgan Hill at about 8:20 p.m. when a GMC pickup struck the two of them. Both Haughay and his horse died at the scene. The driver told newspapers that he didn't see the 1,200 pound animal on the side of the road and hit the brakes too late, said MercuryNews. Officers said there was no evidence that Blaine Beck, 58, was under the influence; though it will take up to two months to investigate the accident. Haughay described himself on his blog as "a software engineer with a long career in developing applications for the Apple Macintosh and Windows platforms. I have worked on such products as IBM's ViaVoice for Macintosh, and Synergy Software's Kaleidagraph. Recently, I have relocated to Cupertino, California, where I have accepted the dream job of a lifetime, as an application engineer working on perhaps the most culturally important consumer product of our time, the iPod. My passion is my horses. 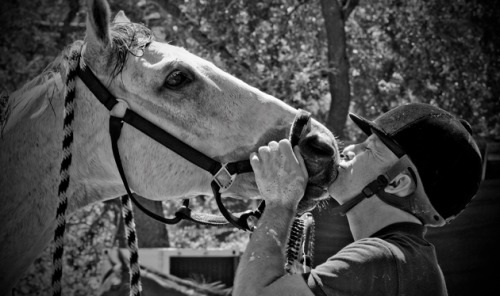 When I am not working, I spend most of my free time at the barn riding, training, and taking care of my three horses." The viewing for Allen "Skip" Haughay Jr. is scheduled from 11 a.m. to 1 p.m. at Oak Hill Funeral Home at 300 Curtner Avenue. Services will follow at the Chapel of the Oaks at the same address. Left behind are Haughay's parents, sister and partner, Abel Urbina. A funeral service will be help at Chapel of the Oaks today and both Regal Bull and Haughay will be cremated, their ashes remaining together at the farm. Our deepest sympathies go out to his family and friends.